Abstract. A prototype temperature-sensing pair of waders is introduced and tested. The water temperature at the streambed is interesting both for scientists studying the hyporheic zone and for, e.g., fishers spotting good fishing locations. A temperature sensor incorporated into waders worn by members of the public can give scientists an additional source of information on stream-water–groundwater interaction. A pair of waders was equipped with a thermistor and calibrated in the lab. 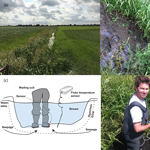 Tests with both the waders and a reference thermometer in a deep polder ditch with a known localized groundwater contribution (i.e., boil) showed that the temperature-sensing waders are capable of identifying the boil location. However, the temperature-sensing waders showed a less pronounced response to changing water temperature compared to the reference thermometer, most likely due to the heat capacity of the person in the waders. This research showed that data from temperature-sensing waders worn by the public and shared with scientists can be used to decide where the most interesting places are to do more detailed and more expensive research. How to cite: Hut, R., Tyler, S., and van Emmerik, T.: Proof of concept: temperature-sensing waders for environmental sciences, Geosci. Instrum. Method. Data Syst., 5, 45-51, https://doi.org/10.5194/gi-5-45-2016, 2016. Temperature-sensor-incorporated waders worn by the public can give scientists an additional source of information on stream water-groundwater interaction. A pair of waders was equipped with a thermistor and calibrated in the lab. 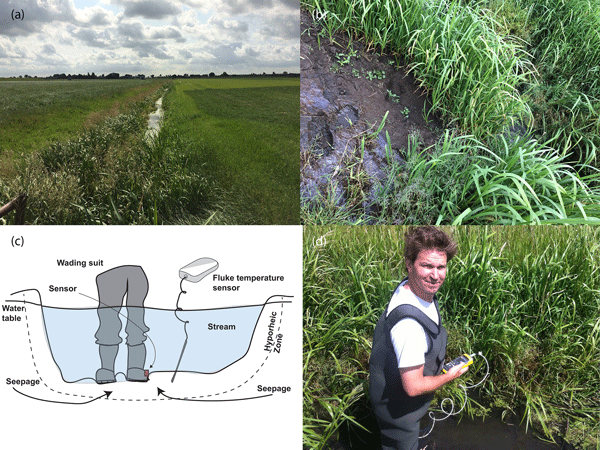 Field tests in a deep polder ditch with a known localized groundwater contribution showed that the waders are capable of identifying the boil location. This can be used to decide where the most interesting places are to do more detailed and more expensive research.